I love colored mascara and Indian markets don’t have much options to offer. So, whenever I spot one I immediately purchase it. Colorbar has been selling colored mascara for a while now but I got to know only recently when I bought it (maybe it was relaunched?). Out of the three shades available- Green, Blue and Purple, I bought the Purple one (I cannot have enough purple eye makeup). Colorbar starry eyes mascara come in plastic tube with silver colored cap. The tube is transparent on its own so you can see the color of your mascara and sort it if you have multiple colors of the same. The shade name is sticker-ed at the base of the tube. Like all Colorbar products, the outer packaging is silver cardboard containing all the details about ingredients, claims, price etc. The packaging is okay, not very great not too bad, just ok. The wand is short and stout with short bristles. The mascara is too creamy and ends up being clumpy if you are not careful. So apply only a small quantity at a go, wait for it to dry and then apply second coat. Also, it takes longer to dry than other mascaras. Being too creamy, the brush is unable to separate the lashes making it look clumpy. But if applied carefully, this mascara looks gorgeous. Unlike the dramatic Lakme blue mascara I reviewed HERE, Colorbar Starry eyes mascara in shade Starry Mauve adds subtle color to the eyes which may not be much visible from a distance. But from close it looks beautiful. Once dry the mascara does not crumble and stays put provided you donot rub your eyes. It is easy to remove so it wont break your eyelashes like some stubborn mascaras. In the swatch below I have applied 2 coats of this mascara on my upper lashes. Overall, I am not much impressed with this mascara. Colorbar Starry Eyes mascara is too creamy for my liking and ends up being clumpy on the lashes if not applied carefully. It takes long to dry so you need to wait a bit before applying another coat. The pigmentation is nice and it looks subtle on the eyes. It is not a dramatic color so not much visible from a distance, but looked closely this looks beautiful. I think it is pricey for the quality and I will probably not repurchase it. It has been a ages since I last did a tutorial. 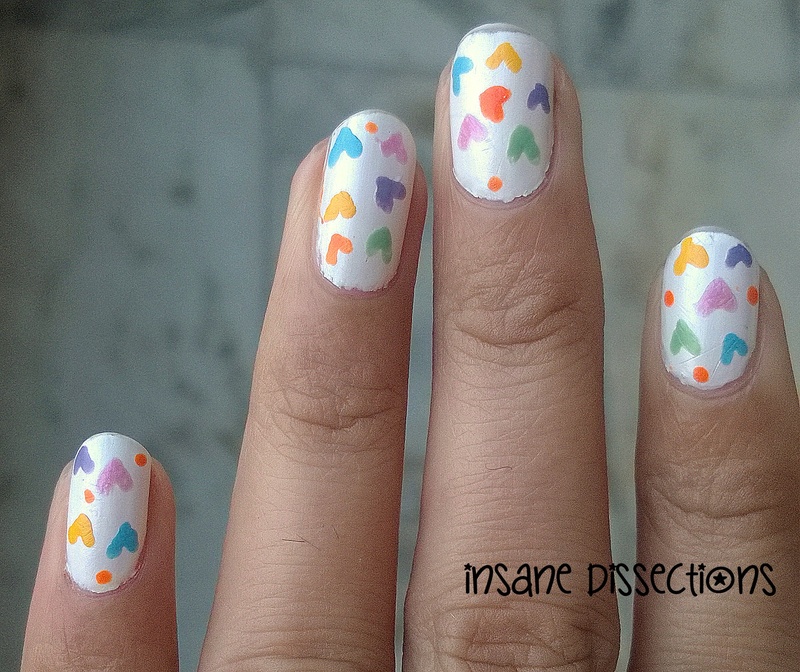 So I am back with a super simple tutorial for Floral nail art. 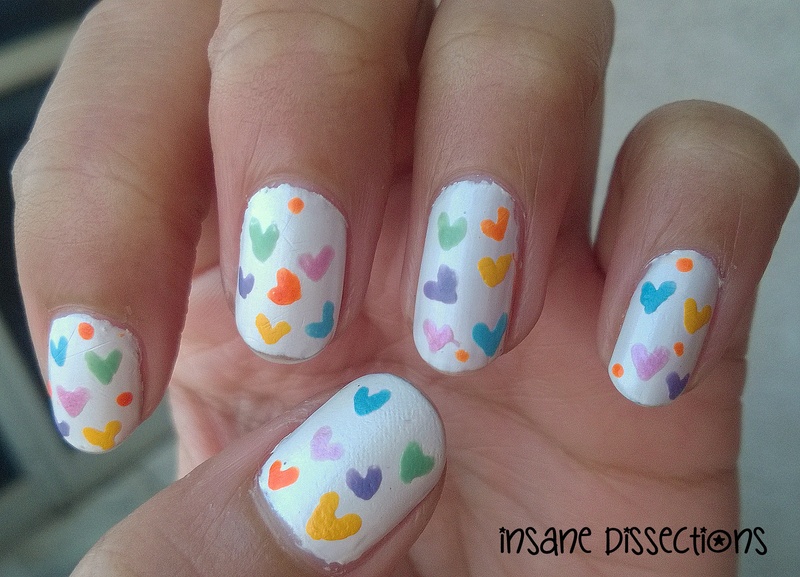 I am thinking of posting more nail arts on the blog. I have done other Floral nail arts HERE and HERE. You can choose whichever shade you like. 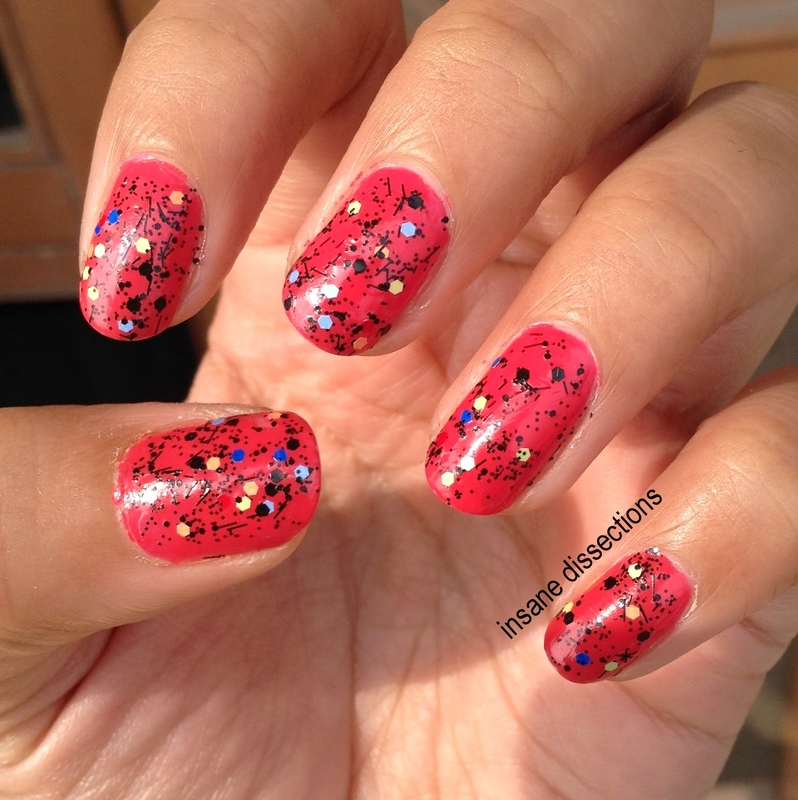 I used Nykaa Neon Matte in shades Cherry Pop (Orange) and Pink Lemonade (Pink). 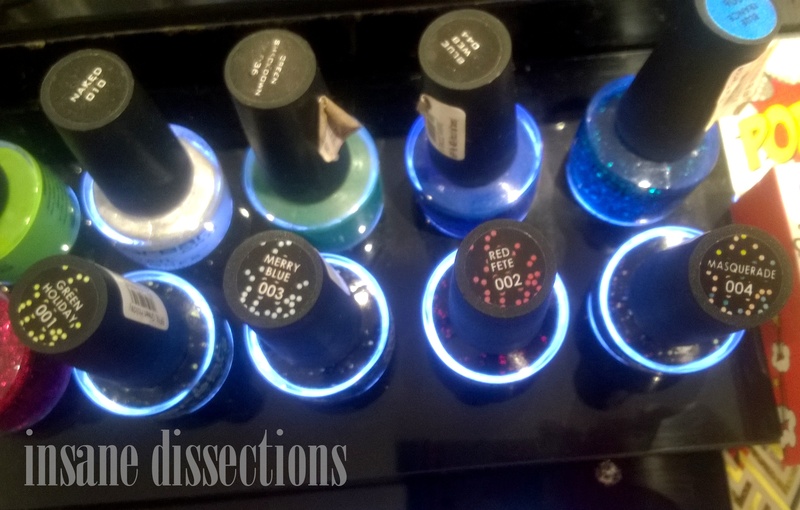 See the proper swatch of these nail polish HERE. Paint the base color of your choice. I chose white as it is a perfect canvas for any nail art . 2. 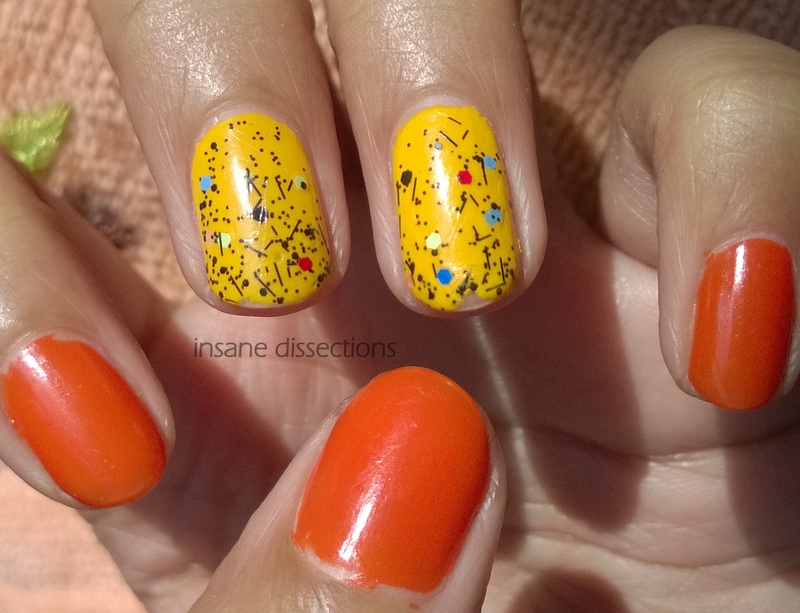 Using back of the toothpick place random colorful dots on the nails. Make sure not to dot too closely. 3. Using the pointed end of the toothpick, pick up some white nailpolish and draw swirls inside the colorful dots you painted. 4. 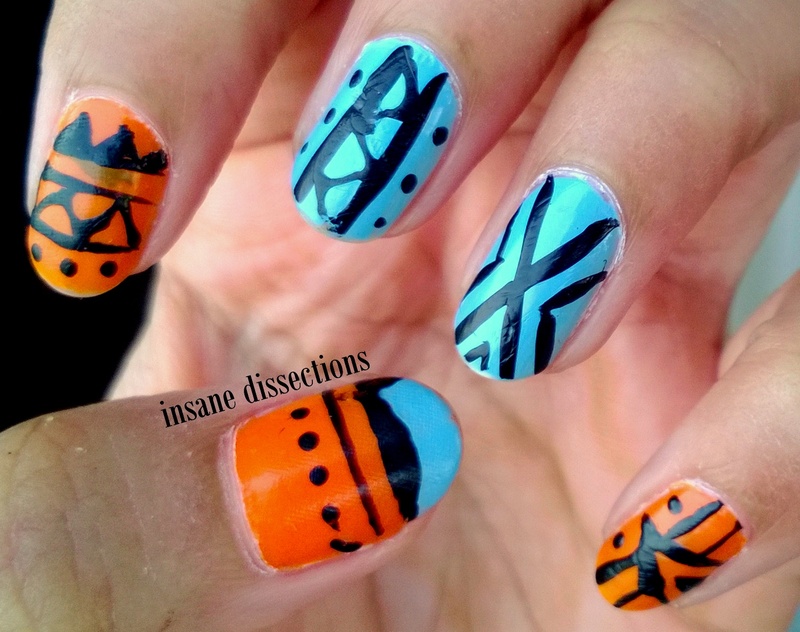 Using the pointed end of another toothpick, pick up green nailpolish and add random short lines around the colorful dots. This will make the leaves. 5. Seal with a top coat. Tadaaa! Do tag me if you recreate this nail art. I would love to see it. This was supposed to be a color block nail art of pink and yellow, but then I added a zig zag line (just like that) with a nail art pen. So this is one nail art when you have absolutely no time on your hands and want to run the minute after doing your nails. 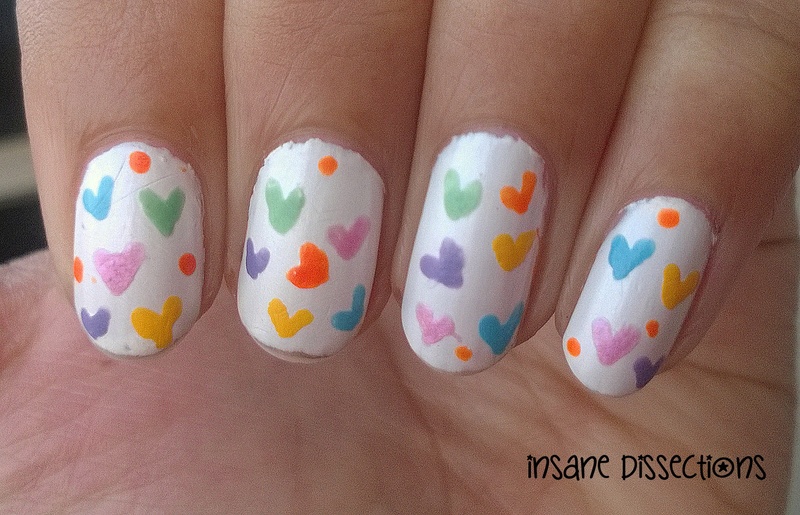 Just grab two contrasting shades of nail polish and one confetti polish and you are good to go. 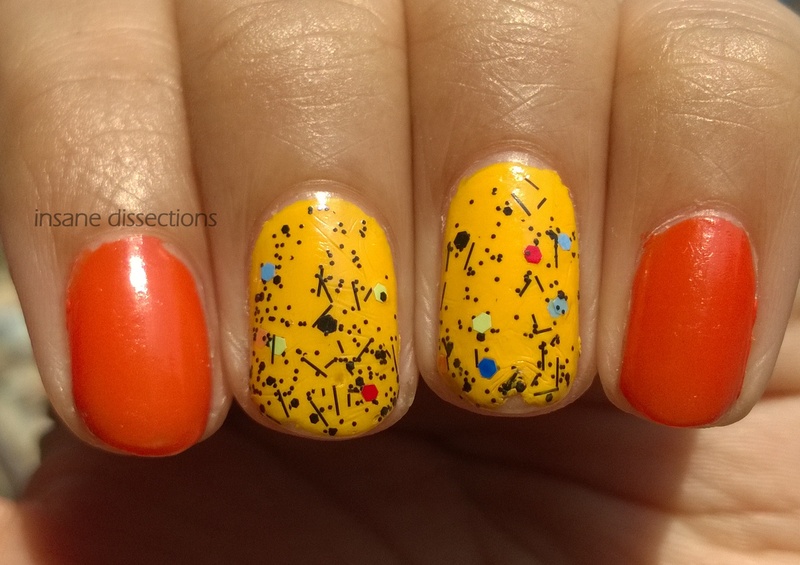 I chose orange and yellow because I LOVE bright nail polish. You can use any colors. Spring/Summer is in full bloom now and its the perfect time to flaunt them bright paws. 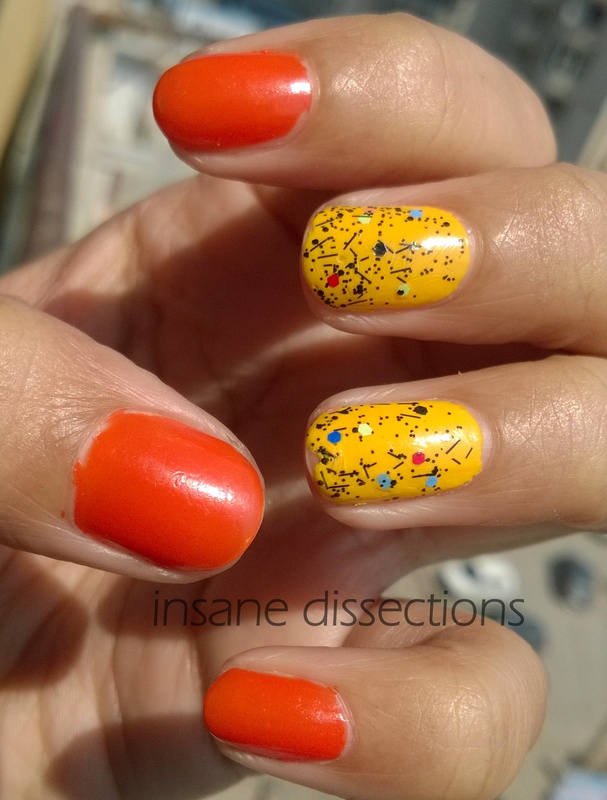 Though I do not follow this dark-for-winters or bright-for-summers thing religiously, I thought this bright, funky nail art is just perfect for this time. 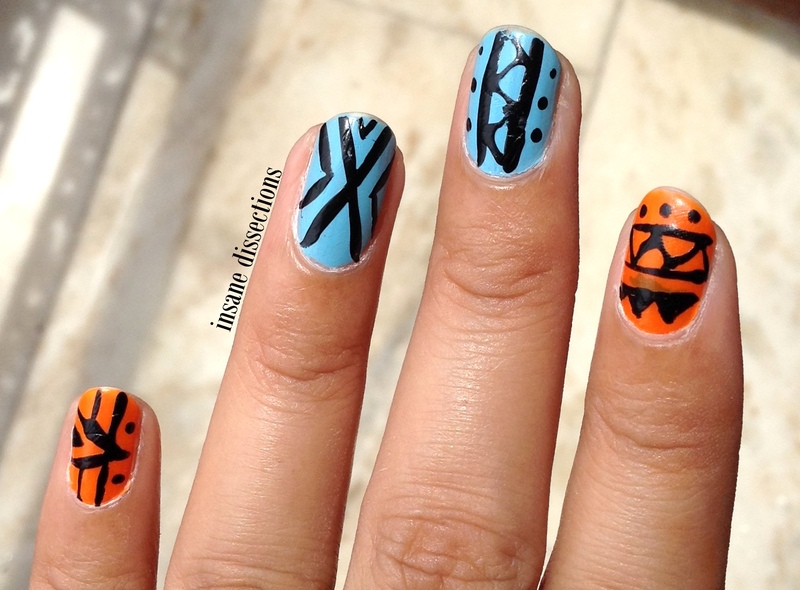 I love tribal design. On clothes, on footwear, on nails- you give it to me and I will wear it happily. Actually I am on a hunt for bright funky tribal sandals for the summers. But I never seem to find the right one. Anyhoo, I hope you like my pop of blue nail art. 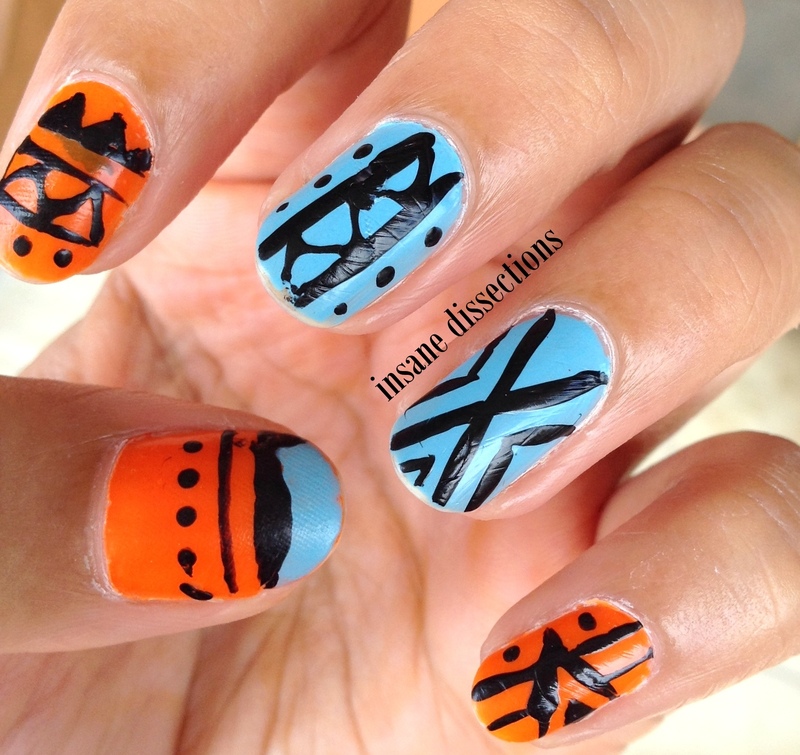 I have done tribal nail art before as well. Check it HERE. I have created the design using nail art pen. You can use an old eye liner brush as well. I am so excited while writing this post. This is the first time any nail polish brand has launched Polka dot/ Confetti / Graffiti nail polish in India. Maybelline Colorshow, Loreal had their entire Polka dots range in US but it never launched in India. 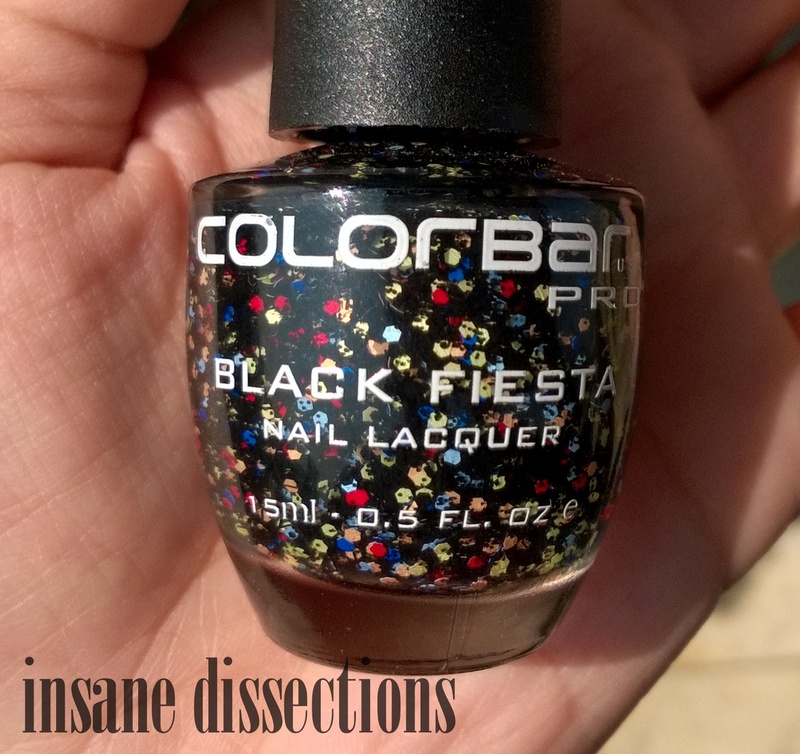 Finally, Colorbar heard us nail art lovers’ plea and launched its amazing Black Fiesta collection. 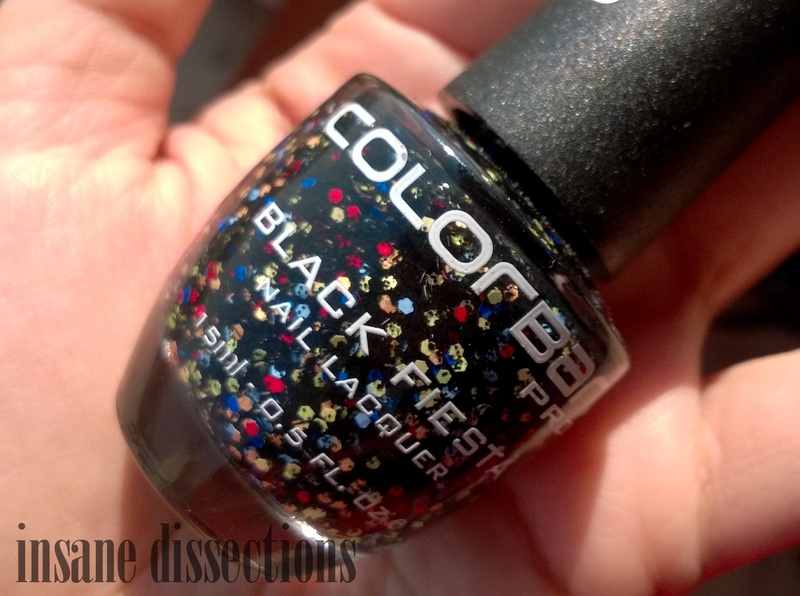 Black Fiesta is a range of top coat from Colorbar which consists of matte glitter in various sizes and shapes. 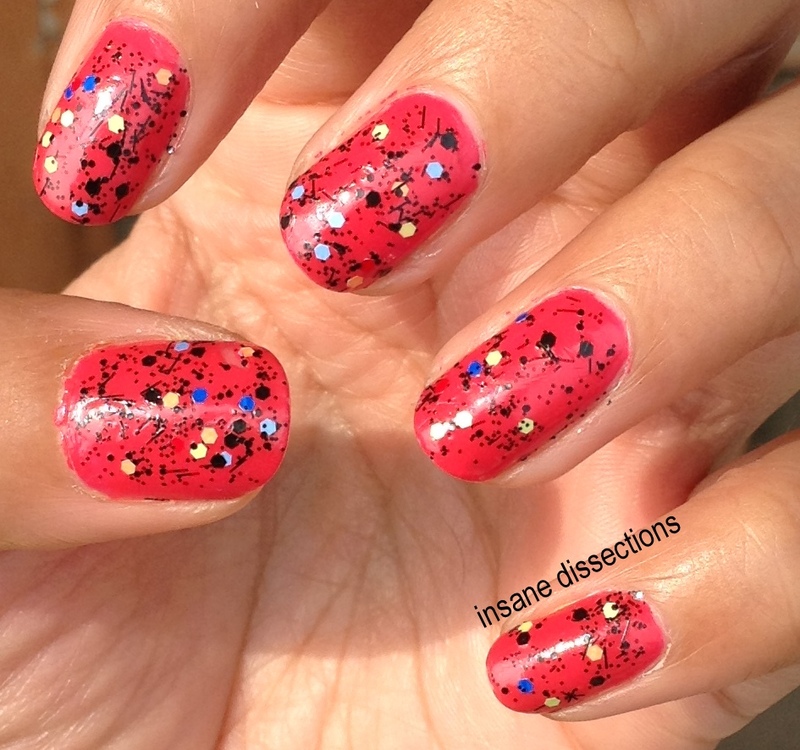 Overall, this nail polish gives a fun paint-splattered effect. This nail polish predominantly contain black specks and glitter along with the colored hexagonals, hence the name ‘Black’. This range is launched in four shades- Green Holiday (Green), Red Fete (Red), Merry Blue (Blue) and Masquerade (multi colored). When I saw these beauties sitting on the Colorbar counter, I didn’t think twice and immediately bought one. All the shades are equally beautiful and I had a tough time choosing the Masquerade one. This comes in a round glass bottle which is sturdy and does not break if it slips your hand (Dont smash it on the floor to check its strength though!). 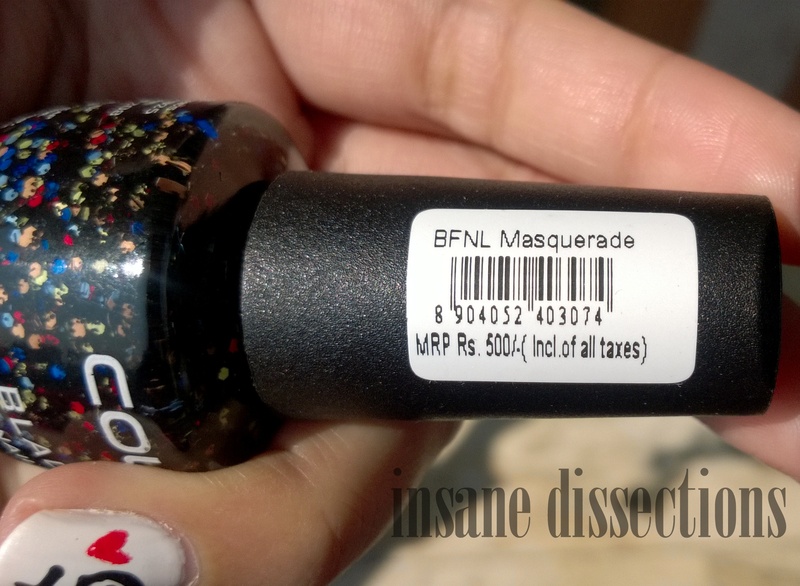 The packaging is same as the Colorbar Pro Nail Lacquer (Rs 350 nail polishes) and the Glitterati range. The brush is long enough and perfectly wide which picks up the right amount of glitter and covers the entire nail in 2 strokes (I hate thin brushes in nail polish which not only require multiple application but also end up streaky). The shade name is written on top of the brush. This comes in 15 ml size which is HUGE. Even if you use this top coat religiously, it will last at least an entire year for sure. This nail polish is loaded with the glitters which remain suspended and does not settle down at the bottom of the bottle. The glitter does not tug and the nail polish settles into a smooth finish. When you apply this top coat, the hexagonals may not spread evenly on their own and one has to spread and place them evenly themselves, especially if you are applying a thin coat. But if you apply a thick coat or multiple strokes, the black dots and strips may cover the colored hexagonals making it more black and less colorful, as the hex (colors) get covered by the dots/strips. The hexagonals do not fall off with time but the lighter ones do start to discolor around the edges after 4 days, but that is visible only if you look very closely so one need not worry. This nail polish is not fast drying. Even though the surface of polish dries fast and it feels dry to touch, but if you do some work involving your nails, this polish will smear. I am IMPRESSED with the staying power. Normally nail polishes do not stay this long on my nails. Any nail polish I wear, I start seeing teeny tiny tip wear (especially on right hand) from next day itself. And by 3-4 days I start to see proper tip wear (not chipping). But this nail polish surprised me. It may be because this is a top coat and I usually do not wear a top coat. But overall, this is really long lasting. Stayed put for one week! (minor chipping on right hand started around 4- 5th day!). 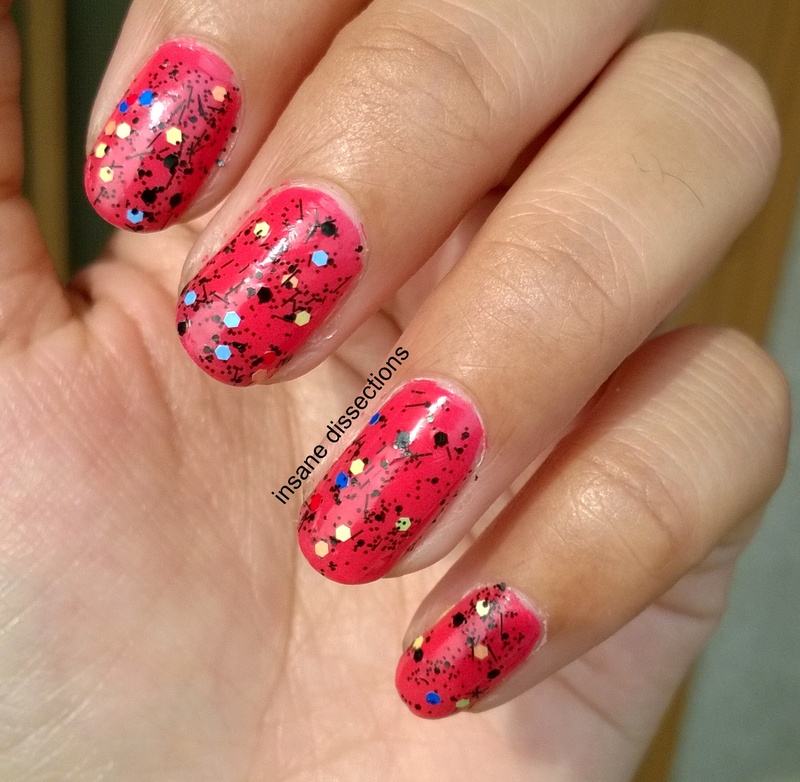 Maquerade applied as sheer coat on top of Colorbar Pro nail lacquer in shade- Bubbly Pink.